Set in Grantchester, a village near Cambridge, The Grantchester Mysteries begin in the early 1950s, with Chambers as an unmarried priest. Forgiveness of Sins is set in the mid-1960s, and Chambers has married and fathered a young daughter. In addition to telling Chambers’ story, the novels chart the tremendous social changes taking place in England in the Cold War period. As for the mysteries themselves, Forgiveness of Sins includes a man who thinks he has murdered his wife (but hasn’t), a physically abusive aristocrat who comes to a bad end, a Cambridge professor killed (accidentally?) by a falling piano, an engaged friend receiving death threats unless she calls off the wedding, an explosion at a public school’s chemistry lab that reveals the school’s dirty secrets, and an art theft in which Chambers finds himself the accused. Personally, I am ecumenical in my taste for mystery. I like character studies and police procedurals—Sidney Chambers and Harry Bosch. Each of those detectives, and the series written about them, are worth reading, even though they are entirely different ways of writing about crime. As I said, I think each installment in The Grantchester Mysteries is good, but Sidney Chambers and the Forgiveness of Sins is the best one yet. If you want to read it for yourself, however, don’t start with it. Start with the first book of the series, Sidney Chambers and the Shadow of Death. Then you can trace the arc of character development and understand why the characters relate to one another as they do. Nones constitute a rapidly growing segment of the U.S. population. According to data from the 2008 American Religious Identification Survey, nones nearly doubled between 1990 and 2008, from 8.1 to 15 percent. Pew’s own data indicate that the share of nones grew by nearly 42 percent between 2007 and 2014, from 16.1 percent of the U.S. population to 22.8 percent. For Christians committed to obeying the Great Commission (Matt. 28:16–20), nones are a new people group to be reached with the gospel. The question is how. In The Rise of the Nones, James Emery White provides an “analysis” of this demographic (Part 1) that explains “a revolution of mindset and strategy” which the church needs to effectively evangelize them (Part 2). White has a good handle on both the intellectual and practical aspects of Christian ministry in an increasingly secular culture. He is founding senior pastor of Mecklenburg Community Church in Charlotte, North Carolina, 70 percent of whose total growth has come from nones. And he has a Ph.D. from The Southern Baptist Theological Seminary in Louisville, Kentucky. According to White, “The real mark of a none is not the rejection of God but the rejection of any specific religion” (p. 23). In that sense, they are “spiritual but not religious.” This spirituality does not turn them into “seekers,” however. Rather, it is consistent with what Jonathan Rauch describes as “a disinclination to care all that much about one’s own religion, and even stronger disinclination to care about other people’s” (p. 27). White analyzes the causes of this rejection of religion, and the worldview that results from it, in Part 1—an analysis that need not detain us here. Rather, I’d like to focus on the advice for reaching nones that he outlines in Part 2. White notes that most churches’ outreach strategies “rest on a single, deeply flawed premise that people want what you have to offer” (emphasis in original). In the very next sentence, however, he writes: “More often than not, they don’t” (p. 89). Like Jonathan Rauch, many—if not most—nones simply don’t care about religion. When churches send out slick mailers promising a church experience with a casual atmosphere, contemporary music, relevant messages, and good coffee, nones chuck them in the trash because they already have those things…without organized religion. What is needed is a new mindset, a mindset that is willing to change the way we do things in order to effectively reach a post-religious generation. Unfortunately, too many churches cater to the spiritual consumerism of existing Christians, even as they vocalize a desire to reach the lost. White doesn’t mince words: “we say we want them [i.e., the nones] in heaven—but we act like they can go to hell” (p. 84). To reach nones, we need to think of evangelism as both a process and an event. “The goal is not simply knowing how to articulate the means of coming to Christ,” White writes in reference to the conversion event. Rather, he continues with reference to the process of conversion, “it is learning how to facilitate and enable the person to progress…[to] where he or she is able to even consider accepting Christ” (p. 93). In other words, first unchurched people accepted the gospel, then joined the church, then started supporting the church’s mission. In other words, unchurched Baby Boomers needed to trust the church again before they could express commitment to Christ and support the church’s mission. “Today,” White writes, “it is cause that arrests the attention of the world” (p. 101). Nones are interested in the common good, not personal conversion. Some Christians seem to be interested in conversion rather than the common good. Jesus was interested in both. “Jesus wed mission and message together seamlessly,” White says, “proclaiming the kingdom that had come while healing the leper and feeding the hungry. He mandated concern for the widow and orphan, the homeless and naked, the imprisoned and hungry while speaking of the bread of life and a home in heaven” (p. 102). If Jesus, so the church; we should be interested in both conversion and the common good too. Notice that White has not discarded the event of evangelism, namely, a call to repentance and faith. The strategy he outlines pertains to the process whereby nones see that conversion to Christ makes sense. “Even if it takes a while to get to talking about Christ,” he argues, based on ministry experience, “[nones] get there” (p. 108). White’s discussion of mindset and strategy includes far more than I’ve outlined in this review. To get that, you’ll need to read the book. And I worry that a focus on cause may become as unattractive to nones as slick mailers advertising a “casual atmosphere” and “good coffee.” Nones don’t need to go to church to get coffee; do they need to go to church to get a cause? A church not committed to the common good is not representing Jesus well, but nones won’t necessarily come to Christ just because the church pursues it. 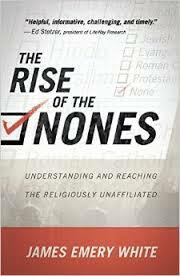 Regardless, I recommend The Rise of the Nones for its thought-provoking analysis and guidance regarding mindset and strategy. I haven’t touched on all the points White makes, but I hope this review has given you a better understanding of the challenge of and a strategy for reaching nones. They’re not interested in religion—yours or their own. To get them to Christ, you must start with what interests them and draw them—slowly, patiently—to Jesus. P.S. If you found this book review helpful, please vote “Yes” on my Amazon.com review page. As a general rule I try not to talk in the conditional mood, especially when it comes to family life. Everyone has their own circumstances and I respect that. I really do. But if you aren’t otherwise engaged in some duty that precludes it—say, the priesthood—and you have the opportunity, then you should be a father. There is nothing more vexing, exhausting, noble, or manly. Read the whole thing: A Dad’s Life | The Weekly Standard. If anyone needs further evidence of why the news agencies often can’t be trusted to report accurately on Israel and the Palestinians, and why major news outlets such as the New York Times and the BBC should stop repeating agency copy without verifying it, here is an important example from this weekend. Media Gets Pope’s Abbas Comments Wrong | The Weekly Standard. 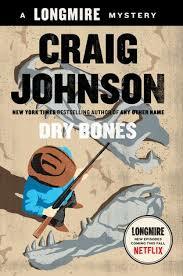 Like many people, I became aware of Craig Johnson’s Walt Longmire mysteries through Longmire on A&E. (Netflix has acquired the show and will air its fourth season). The TV show is a different beast than the books. While I enjoy both, I still prefer the latter. The mystery at the heart of Dead Bones is the death of Danny Lone Elk. Lone Elk owns a ranch on which a large, complete Tyrannosaurus rex skeleton has just been unearthed. The find is worth millions to whoever owns it. But Lone Elk’s ownership is contested among the federal government, the Cheyenne reservation, and the Lone Elk family. And then, of course, there’s the question of whether Lone Elk died naturally or was murdered. Longmire works through these questions in his characteristic Absaroka County way. There’s the patient questioning of witnesses, the mystical experiences, the encounters with a nature indifferent to human wellbeing, and the sly sense of humor. One of my favorite gags in this book is the stoically raised fist and incantation of the words, “Save Jen.” (Jen is the name of the T-rex whom the Absaroka residents want to keep at the local dinosaur museum.) Trust me, it gets funnier as the book goes along. I’m a huge Longmire fan. As much as I enjoyed this book—and I enjoyed it a lot and read it in one evening—I didn’t think this was the best installment in the series. It’s not bad, mind you. (I can’t imagine a bad story by Craig Johnson.) It’s just not the best. Even so, if you like the other Longmire books, I know you’ll like this one.